N.B. 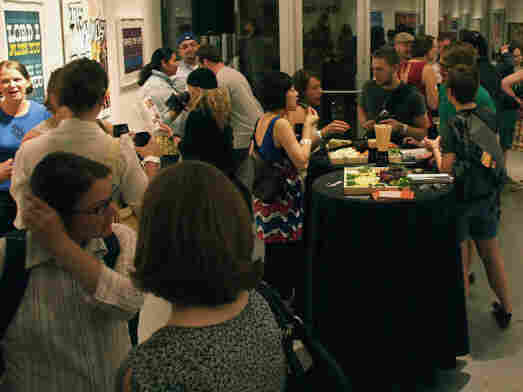 : How To Behave At A Gallery Opening : Blog Of The Nation Though Sarah appreciates art in a reasonably active fashion, she's intimidated by small galleries. To the rescue: I Like Your Work: Art And Etiquette's "Guidelines for Openings," with useful tips on when to arrive and what to expect. Friday night after a delicious dinner out, my husband and I walked by an art gallery opening in full swing. The room was brightly lit, the paintings looked interesting and everyone seemed to be having a roaring good time. And though they had a sign on the sidewalk inviting passers-by in, we just headed for home. The thing is, though I appreciate art in a reasonably active fashion, I'm intimidated by small galleries ... Which is really too bad, since if I could ever get through the door, those are the places that house the works that might interest me most. Well, next time I'll have these in my back pocket: I Like Your Work: Art And Etiquette's Guidelines for Openings. They're more geared toward artists hoping to insinuate themselves into the art world, but there are quite a few tips that could help meek appreciators like myself. 5. Be briefed on at least three recent things that you can be congratulatory about: recent exhibitions seen and enjoyed, exhibitions you would like to see and enjoy but have not been able to make yet for whatever reason, recent successes by colleagues. And oh yeah, if you're just in it for the free booze and food? 3. The dealer is required to provide alcohol and non-alcohol to all the guests. This can be as simple as a tub of beer and bottled water. It can be fancy wines and freshly squeezed juices, cheese platters, and a bow-tied bartender. There ought to be alcohol for at least the first two hours of a three-hour opening. The last hour is usually best, but not if there’s no alcohol. So, time your arrival and have something interesting to say -- good tips. Read the full list at n+1.